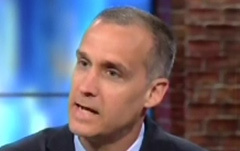 WOLF BLITZER (HOST): Corey Lewandowski, what was your reaction to hearing this audio and seeing the video? COREY LEWANDOWSKI: Look I think what this comes down to, and this is not a surprise, is clearly this is not how women should be spoken about. But we're not choosing a Sunday school teacher here. And I want to be very clear about this. And what we know about Donald Trump, this is 12 years ago, this audiotape. And it does not reflect or bring to mind the Donald Trump that I've spent 18 months with traveling. I've never heard anything like this out of him. And so let me say, we're appointing a leader. We are electing a leader to the free world, we're not electing a Sunday school teacher. And I spoke with Jerry Falwell, Jr., who runs Liberty University, and he went out and he reminded us of the difference between Ronald Reagan and Jimmy Carter. Jimmy Carter was the absolute best person to be a Sunday school teacher for their children. But to have a leader, someone who is tough and will be respected around the world, that's what we're doing here. And that's what I think Donald Trump is. And are his words perfect? Absolutely not. Is this defensible? I don't think so. What I do know is that he has apologized if anyone has been offended. This was a private conversation. But I know Donald Trump as the husband. I know Donald Trump as the father of two women. And I have seen firsthand the respect that he's had for women over my tenure, during employment through the Trump Organization and the Trump campaign. So let me say, this private conversation obviously is troubling, but we want a leader who is going to lead America. And you know what, is that rough sometimes? It is. Is this defensible? Absolutely not. But what I do know is he's still the person that's going to lead our country forward and we should be thinking about what that true leadership looks like with the rest of the world. The AP Claims Trump Apologized For His Despicable Comments About Women. He Didn’t.